We have discussed at length the major components of our Solar System. At the center is the Sun; and surrounding the Sun are nine planets, many with its own system of moons. However there are other important members of our Solar System: Asteroids, Comets, Kuiper Belt Objects and the Oort Cloud. While the Solar Nebula contracted enough to form the planets, the residual material remained as the asteroid belt and Oort Cloud. The gravity influence of the Sun and planets can knock a few objects out of these two areas and place them in a highly-elliptical orbit. More data can be found at the Asteroid Home Page and the Asteroid Fact Sheet. 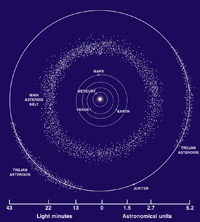 The asteroid belt is a band of debris orbiting about 2 to 3 A.U. 's from the Sun. This orbit is between Mars and Jupiter, and should be a planet. The tremendous gravity from Jupiter has perturbed the belt so that the debris did not form a proto-planet during our Solar System formation. 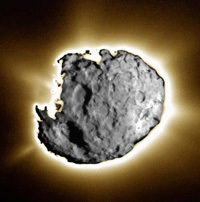 There are about 100,000 known asteroids within the belt with more discovered almost every day. Of all the asteroids, the largest is Ceres at a diameter of 934 km. Ceres accounts for 30% of the total mass of the belt, so the majority of the asteroids are very small - less than 1 km in diameter. There are actually two belts: the main asteroid belt and the Trojan asteroids. The Trojan's are held in a point 60 from Jupiter, called the Lagrange point. These orbits are stable, and are the result of the gravity of both the Sun and Jupiter. While the asteroid number is large, if brought together to form a single body they would make a planet about as large as our Moon. 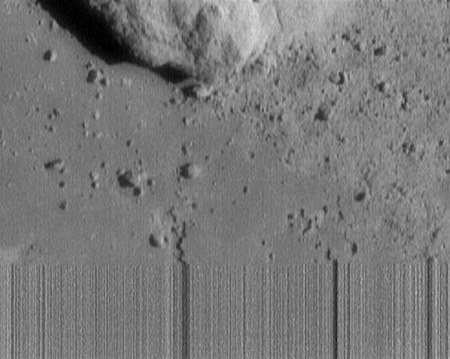 While the movies depict asteroid belts as very dense regions, in actuality there are wide spaces between each body - so much so that every probe we have sent through the belt had to be programmed to come close to an asteroid if we wanted an image. 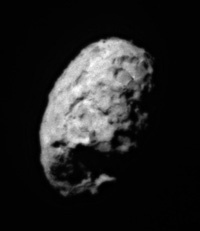 As far an naming the asteroid, that is left up to the International Astronomical Union. Names of asteroids are usually numbers associated with a name and/or date of discovery. 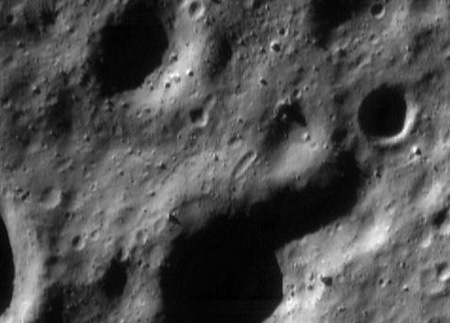 The first asteroid discovered was Ceres, so the official name is 1 Ceres. Another major category of asteroids are called Near Earth Objects, left to its own section. 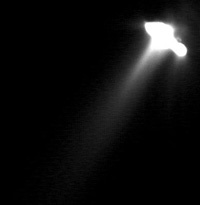 The images above show the jets that are released from within the comet. The results of the impact of Shoemaker-Levy 9 was captured by the Hubble Space Telescope. 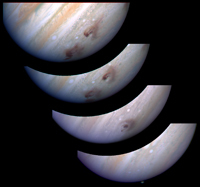 There are clear disturbances to the upper atmosphere of Jupiter, and this effect did remain for several months. 21 fragments of the comet entered the atmosphere of Jupiter. NASA has a dedicated website that provides additional information on the Comet Shoemaker-Levy 9 impact. Meteor impacts on Earth are rare, but hundreds of meteorites are seen every year. 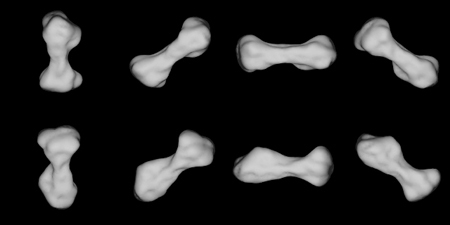 More details about meteors are found in the NEO section. All of the impact craters on the other planets and moons are the result of meteor impacts. 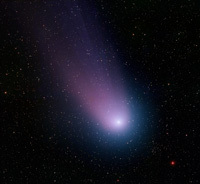 More comet data can be found at the following NASA Fact Sheets: Comet Fact Sheet, Comet Hale-Bopp, Comet C/1996 B2 Hyakutake and Comet Chiron. The Oort Cloud (below) is though to be the origin of long period comets (more than 100 year orbits), but short period comets (less than 100 year orbits) had to originate closer to the Sun. Dutch Astronomer Gerard Kuiper proposed these object came from a new belt of comets just beyond the orbit of Pluto - the Kuiper Belt. 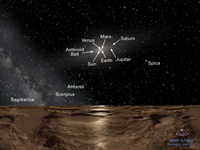 In actuality, all of the icy-rock bodies - like Pluto, Charon and Sedna - beyond the orbit of Neptune are in a classification called Trans-Neptunian Objects or TNO's. The Kuiper Belt Objects and the Oort Cloud are subdivisions within this region. 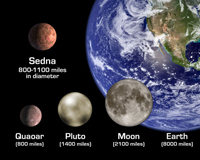 The theory of the Kuiper Belt was confirmed by the discovery of Sedna, a Pluto-like body with a distance of 13 billion kilometers from the Sun. Its orbital duration is a slow 10,500 year period. 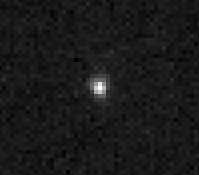 This image of Sedna by the Hubble Space Telescope is our clearest image of one of these Kuiper Belt Objects - or KBO's. Dutch Astronomer Jan Oort proposed that our Solar System is surrounded by a vast sphere of debris called the Oort Cloud. This proposition seemed to fit the fact that comets appear to come from all directions, and not just the equatorial plane of the Solar System. This sphere is quite large, and is though to be between 20,000 and 150,000 A.U. - remember that an A.U. is an Astronomical Unit, or the Earth-Sun distance. 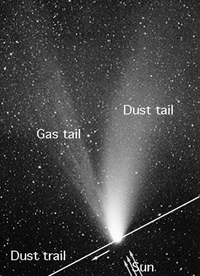 Comet Hyakutake and Hale-Bopp are long period comets that originated from the Oort Cloud. 80% of all known comets have the same origins.